Close your eyes…bear with me for a moment. 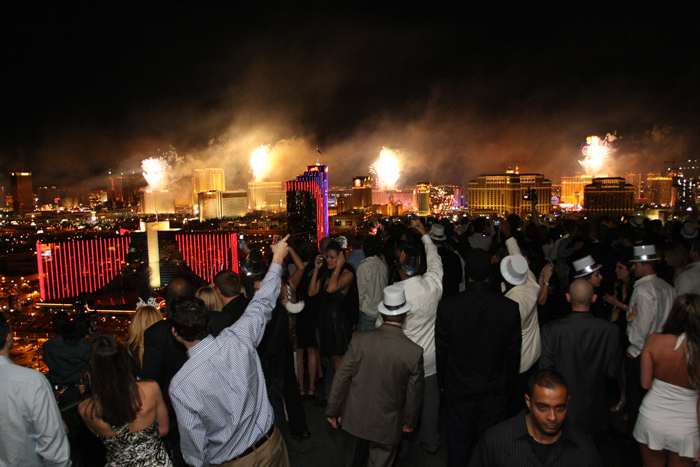 When you hear the words: New Year or New Year’s Eve, what kind of images does it conjure? Images of Times Square, maybe? Family and friends? A large clock with the standard sequential countdown? Whatever it may be, the truth is that some people think of it as new beginnings or a fresh start and others think of it as the biggest day of the year to party! Whichever side you prefer, the fact of the matter is December 31st is a day of reckoning. It may be the last day of a bad habit that you swear you’re going to stop….this time, you mean it. It may have been circled on your kitchen calendar for better part of seven months. For many of us it will be a day for celebration. Out with the old and in with the new. Now along with a renewed sense of self fulfillment and energy to start January 1st the right way, you also have to think about this: where is the best place to celebrate the New Year? There is only one answer: Las Vegas. Did I stutter? You’re damn right I didn’t! Vegas baby! Allow me to illustrate why Vegas is so amazing this time of year and why you will immediately put it on your bucket list. Take notes. This glorious city in the desert attracts countless people worldwide year around. What is the keynote date for all clubs, casinos, restaurants, resorts and entertainment venues in Vegas you ask? That would be New Year’s Eve of course. The streets are closed. You cannot go to east to west or north to south, unless you are Peter Pan. From Sahara Avenue down to Russell Road, the only thing you will see is an enormous tapestry of humanity aimlessly wandering about Las Vegas Boulevard with the bold intention of making sure they have a good time until the suns comes up the next day. The drinks are cheap. The music is amazing. Thousands of people walking, biking, sauntering, stumbling , laughing, joking and making sure they soak up every moment because eventually the clock will strike midnight, and at that point, it gets even crazier. With a drink in one hand and a fist full of cash in the other, guys and girls alike are looking to get drunk and make a connection, even if it’s only for a moment. The clubs light up the night sky with glittering advertisements of familiar artists like Avicii, Benny Benassi, J. Cole, Lil John, and Red Hot Chili Peppers, all performing on this remarkable weekend. Unequivocally speaking, you can expect no shortage of people clamoring for a spot at one of these clubs. If you are lucky enough to get access to the club of your heart’s desire, there is no uncertainty that you will indeed see a celebrity in form or fashion. Oh yes, you heard me correctly. Las Vegas is well known for entertainment and in such, draws those we foster so well, to come and spend their money with us. I, myself have witnessed professional baseball players, well known musicians, retired rock gods and Hollywood elites idly sipping champagne at a table, absorbing the attention that they so famously crave. The best places to see the night sky illuminate with fireworks at the midnight hour, is of course, roof top terrace clubs or any place that is worthy of treating your eyes to a marvelous feast of brilliance and wonder. The locations I would go to are: Ghost Bar, Foundation Room, Mix, Butterfly Terrace at Chateau, the Terrace at Pure, Marquee and the Voodoo Lounge. These locations will provide a superb view of the fireworks. Don’t miss it! Dozens of camera crews from all the major networks will be splattered around the valley with batteries charged and attention at full display. It will be seen on CNN, Fox, NBC, CBS, and Travel Channel, time and time again. The firework display is something that will be talked and rumored about for many months after the fact. Be prepared and make sure your camera is nearby, as you will not want to miss it. 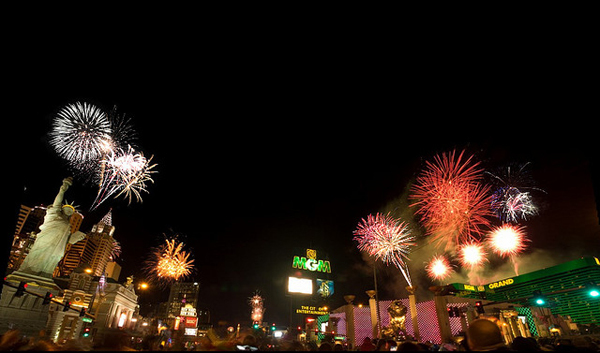 If you ever wondered what a few million dollars’ worth of fireworks looks like, rest your weary mind and worry no more, simply take a jaunt to the strip on December 31st and observe.